Making your own stretcher strips may be very old-school, but it's really a lot of work, which doesn't really add to your painting itself - better order them at the art-supplies store. One side has an edge that stands up: that's the side where the canvas will be. Stretcher strips are available in different sizes - not only lengths, also different widths. Better skip to a heavier quality of stretcher strips, than to use the longest ones available in their width size. If the stretcher strips have extra openings in the middle for a supporting bar or a cross, give it the bar or the cross. Some stretcher strips are made of a single piece of lightwood, which means they tend to warp (along with the woodgrain, if not cut in a perfect 90-degree angle from the wood core). It might be better to buy assembled strips (made of smaller strips of lightwood, glued together), because the bits balance each others warping. The downside of assembled strips: if the glue lets loose, they fall apart (but that might never happen). The warping however, of a lightwood strip that wasn't cut exactly in a square from the wood core - that's sure to happen. First you put the stretcher strips together. Best use a wooden hammer for that, or a piece of wood. If you use an iron hammer: be very, very careful - you easily damage the strips. First you do one corner, then you insert the middle bar, and then the other corner. 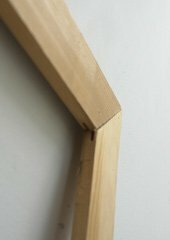 The frame should be straight - you can check that by measuring the frame diagonally, in both ways. If both diagonals are evenly long, it's straight. Stretcher bars - the inner corner. This area is very thin: don't put staples in it (they'll block the possibility of extra stretchning). 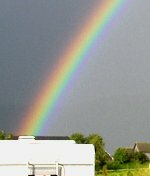 For making an oil painting canvas, use purely natural linen or cotton. The fabric should be stiff and thick, and it has to be unbleached and undyed. If it's stiff with some appret, that's OK: don't wash or iron the fabric. Untreated fabric like this will shrink the most, and that's just what you need to get it stretched. Beware of sharp folds: they won't go away by stretching. The piece of fabric you take, should have 10 centimeters extra on each side (so: for a 30 x 40 cm frame, you take 50 x 60 cm of canvas). You put the canvas on the frame, when it's still just dry cloth. When you're going to size with rabbit-skin glue, stretch it loosely. When you'll size with acrylic binder, stretch it as tight as you can. Check here for more on sizing and how to prepare a canvas. 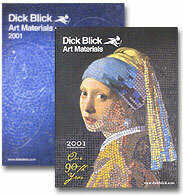 An oil painting canvas can be made of cotton or linen. Linen is more expensive, and also more flexible and durable. Its fibers are longer and it keep its shape better. Every canvas needs restretching or restoration after some decades - but linen can keep good for 100 years, while cotton needs repair after 20-50 years. In time, the fabric with the gesso goes stiff, and cracky. In the art materials store (click on the picture link), you can also get synthetic canvas materials (ready primed, stretched or on the roll), that may keep good a little longer than cotton because it doesn't go stiff. But: no guarantees - the material is still young. Here are some recipe sheets and a product list, for both modern and tradition primers and underpainting materials. The sheets are a part of my ebook on oil painting materials. The products were selected to be least expensive, but still deliver quality. Like in the supermarket: it's not about shiny packages, it's about knowing what ingredients are worth. 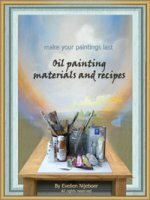 Check here for more about the e-book (76 pages) on oil painting materials. The sheets are free to download when you subscribe to this website. Another great option: canvas rolls. A canvas roll is a roll of primed canvas, of which you cut the sizes you need. You can paint on that and stretch it later, when your painting is taking on shape, or even when it's ready. It gives an extra opportunity to adjust the size, if you need to. If this generates to many options: draw a rectangular shape before you start to work. In terms of materials: for this canvas goes the same as for ready-made canvases - it might be good to give it an extra thin layer of gesso, with some caseine added, to ensure the durability of your work. After putting the canvas on the stretcher strips, you put glue on it, to make the canvas waterresistent and close its surface. The sizing functions as a barrier between the primer and the canvas. Traditionally, the sizing was done with rabbit skin glue. If you use rabbit skin glue: use it as thin as you can. Thick layers of rabbit skin glue cause circular cracks in your painting. You can also size with an acrylic binder (like Plextol). After that, you use the primer - in 3 to 4 thin layers. Beware: for sizing with acrylic binder, you need to stretch the fabric much stronger, than for sizing with rabbit skin glue. Rabbit skin glue makes the fabric shrink strongly. 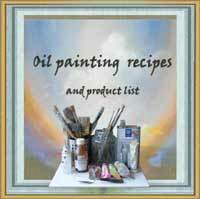 For more on sizing and priming, check out the section on oil painting canvases. When you check the back of your canvas, you see some openings in the corners of the stretcher strips. They're meant as entrances for little pieces of wood. 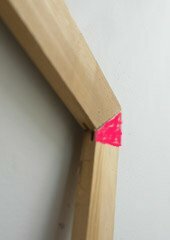 If your canvas went warpy, you can stretch it again by cautiously hitting the appropriate (fitting) slices of wood in the corners, like this (see picture). This can be done with home-made stretcher strip-canvases, but also with ready-bought canvases. 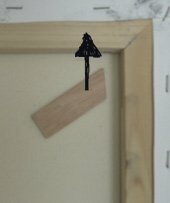 This is how you can stretch the canvas some more, without taking if off the frame, in case it went a bit loose in time. Gently hit the slice of wood in the corner, with a small hammer.